A few months ago, I came across a series of “field guides” related to voting. These were developed by Dana Chisnell of UsabilityWorks as a result of research she conducted with Ginny Redish for the National Institute of Standards and Technology. I’m particularly interested in this topic because I worked as an election judge (the Maryland term for a precinct worker) during four elections, including two as a chief judge (one of the two chiefs at my precinct). I’m pretty sure most voters have no inkling of the multitude of tasks and procedures that precinct workers — almost always volunteers, despite a small stipend for their effort — must try and carry out in order to ensure that people can exercise their right to vote. I want to highlight some of the recommendations from “Writing Instructions Voters Understand.” These make great sense in most job-aid and performance-support contexts, and the Field Guide provides detailed examples for the individual recommendations. So you see the example in context on the left, and then you get details about it on the right. At the beginning of the ballot, explain how to change a vote, and that voters may write in a candidate. I think of this as a “before you begin” instruction. The voter might not be thinking about making errors or changing her mind; having this notice at the outset increases likelihood that she’ll recall it during the voting process. Put instructions where voters need them. 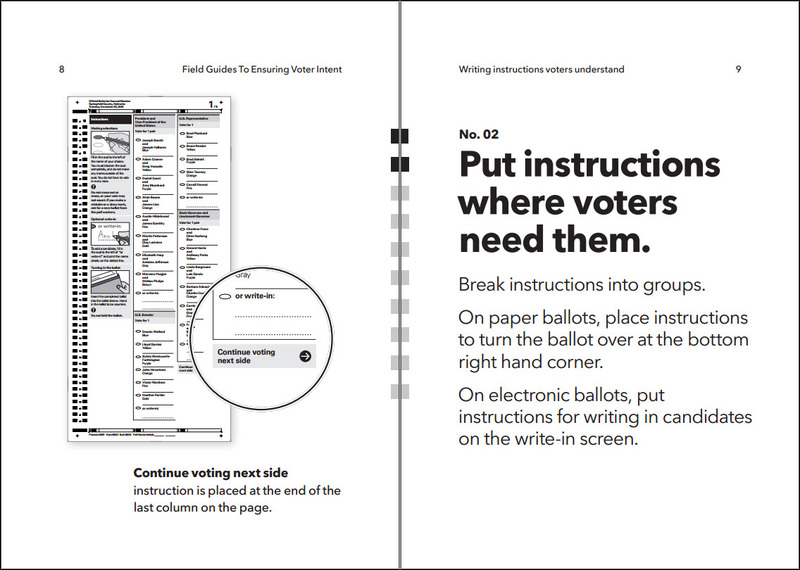 On paper ballots, put turn-over instructions at the bottom right-hand corner. On electronic ballots, put instructions for writing in a candidate on the write-in screen. Include information that will prevent voters from making errors. If you tear, or deface, or wrongly mark this ballot, return it and obtain another. Do not attempt to correct mistakes on the ballot by making erasures or cross outs. Erasures or cross outs may invalidate all or part of your ballot. Prior to submitting your ballot, if you make a mistake in completing the ballot or wish to change your ballot choices, you may obtain and complete a new ballot. You have a right to a replacement ballot upon return of the original ballot. If you make a mistake, ask a poll worker for another ballot. Use short, simple everyday words. While I do enjoy the occasional eyeroll in the director of St. George of Orwell’s prescriptionism, Chisnell’s definitely on the right track. Write in the active voice, where the person doing the action comes before the verb. Note that this guideline is itself an example of avoiding jargon. The average person isn’t good at providing an example of an active verb as opposed to a passive one. Directly from the guide: Tell voters what to do rather than what not to do. If that oval is not marked, your vote cannot be counted for the candidate. You must fill in the oval for your vote to count. When giving instructions that are more than one step, make each step an item in a numbered list. It’s a lot harder for people to keep track of where they are in a bulleted list than in a number one. When steps are a sequence, number the steps. That’s what the numbers are for: showing each item’s place within the sequence. If sequence is not important, then use bullets. An everyday example: the ingredients in a recipe appear before the steps. The ingredients are usually listed in the order you’ll use them, but they don’t have to be, because (presumably) the steps in the recipe will tell you when to add the carrots and when to add the vinegar. My thanks to Dana Chisnell for agreeing to have the Field Guides included in the Ensampler.